We were overwhelmed with the responses for the Bruce Lee Podcast Challenge and found it impossible to pick just one winner, so we’ll be having several winners join us as guests on the podcast. This week we welcome our first Podcast Challenge winner, Kyoko @Jinjabrew! 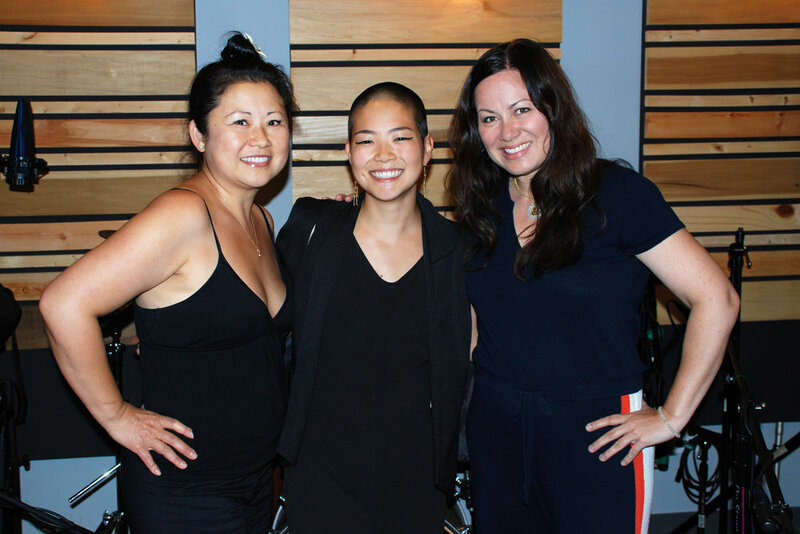 She lives in LA so Kyoko was able to join us in the studio for this special episode. Kyoko didn’t grow up watching Bruce Lee films, but discovered him through activism and research in Asian-American history and politics. While studying the Civil Rights movement of the 60’s, Kyoko wondered where the Asian Americans were in the movement. She didn’t get answers from traditional classes or teachers so she started doing her own research by reading books by Fred Ho and learning about activist Yuri Kochiyama. It was a chapter in the book “Everybody was kung-fu fighting” by Vijay Prashad that introduced her to Bruce Lee’s influence on the Afro-Asian cultural connection and this made her want to find out more about Bruce Lee. At the time she was reading this book, she was moving from Boston to LA, driving solo and looking for a good podcast to listen to on the long drive. The podcast helped put Kyoko in a good mindset for moving to a new city, Los Angeles, which she now calls home. During the two week Podcast Challenge, Kyoko had two major things going on in her life. In the first week, her cousin from Japan, whom she hadn’t seen in 15 years was visiting. She was nervous about the visit before the challenge because her cousin seemed very different from her--dying her hair lighter, dressing like a pin-up doll, wearing light contact lenses and using western styled make-up. While growing up as the only Asian American in a predominantly White city, Kyoko experienced racism and struggled with idolizing Whiteness. She has since processed her pain and grew to embrace her Asian identity and features, but her cousin’s visit was bringing up some old pain and judgments. With the challenge in her mind she turned her negative thoughts into curious ones and decided to be present and inquisitive about her cousin’s beauty regimen. She asked questions about the products and process—all without negative judgments. By simply shifting from negative to curious, she learned so many things from her cousin. She discovered that there is makeup specifically designed for Asian features and skin tones. She learned a lot about the politicization of make-up here in America and about the nutrition and health aspects of her cousin’s routine. If Kyoko had allowed her judgments to keep a barrier between her and her cousin, she wouldn’t have learned so much from her. The primary purpose of her cousin’s visit was to see Joan Jett live. She got really expensive seats for both of them, and made a handmade sign that said “came from JP for you! !” for Joan Jett. Kyoko’s first thoughts were “So touristy!! SO ASIAN!! Everyone will judge us!” But because of the Podcast challenge, Kyoko decided to drop her judgments and just to be present with her cousin and let her do her thing and as a result she had one of the most memorable and joyous experiences of her life. Her cousin immediately started balling her eyes out when they walked in, being overcome with joy – Kyoko had never witnessed an expression so vulnerable, authentic and pure. Her cousin's raw emotions moved her deeply and she was grateful to experience it. Kyoko’s affirmations were written as an inner and outer box. The outer box were reminders about why she wanted this affirmation and the inner box held her main affirmation. Reading this aloud every morning made Kyoko realize that even if you can’t control what your day is going to be like, everyone can have control on how they start their day. Her affirmations put her in a good mindset before she meditated. The second big life event that happened for Kyoko during the podcast challenge was planning the release of her first song and music video. With all the tasks she had to complete to hit her release date, it was good for Kyoko to return to her affirmations throughout the day. She tried to remain present in every task that she did, recalling the “pointing your finger at the moon” analogy, it’s not about the actual release of the song, it’s about the process and the journey, not about the reaction. Kyoko wrote the song “Prince," performed the music, and directed and edited the music video herself. This is the first project where Kyoko really felt in the flow. Now that Kyoko has dealt with her past trauma through releasing her song “Prince,” she’s excited to move on to other ventures, such as acting and martial arts, and to create happy joyful music. Kyoko, we think you’re really blooming as a true artist by allowing yourself to “flow” like water--we support you! Kyoko had three #AAHA nominations for us. The first is Angelia Trinidad, she’s a Filipina entrepreneur and created a planner called “The Passion Planner.” At first she studied to be a doctor and then decided to pursue art. After college, she felt stuck and lost on how to pursue her passions. Angelia realized that her passion and what’s helped her so much is planning her time around her passions and she wanted to help other people plan their passions and implement it into their daily schedule. Kyoko has this planner and it’s really helped her work on all her passion projects. Thanks Angelia for creating this great tool for passion projects—you’re awesome! Kyoko’s other two #AAHA nominations are Shannon and Sharon! She attributes so much of her knowledge of Bruce Lee’s philosophy to the podcast and wanted to thank them for all the effort and emotional labor they put into the podcast. “A few months ago, I auditioned for my very first audition for a comic book superhero character. It was my first audition and I ended up getting a call-back and another call-back for the role, and I was very excited. Before every audition in the car I’d look at myself in the mirror and say “Be like water, Be like water, Be like water.” One of the call-backs was a director’s session and I got called back and said “you’re going to be in a director’s session,” and I was very excited. So I go in there and I’m thinking, “oh yeah it’s just going to be me in the waiting room.” And I look around and there’s twelve beautiful, amazing, Asian American women who are also in the room going for the same role. A part of me started feeling very insecure and that competitiveness of “Oh my gosh, I’m not wearing any leather,” and seeing the sign-up list and feeling “Oh they’re all very experienced, I’ve seen some of them on TV or they’re YouTube stars.” So I started to feel anxious and then I really remembered about what flows with everything, and unity, and the oneness of things, and felt that we’re all in this together and we’re not fighting for one slice of the pie. As Audre Lorde said, We’re fighting for more slices. For representation. So if any one of these people gets it, I should be very very happy. And to be present and open, even if that energy wasn’t there to begin with. I ended up saying hi to the person next to me and being friendly and just asking what their name was and how long they’ve been auditioning and acting. This girl Misumi is now one of my really good friends and she’s also a musician and we’re going to work on a project together. Kyoko helped us close out the podcast episode by performing her song “Prince” live in the studio. This song talks about dealing with the “White male savior” complex she had growing up and addresses her struggles as an Asian American female. And "thinking about the concept of not needing this prince to save us from our lives, we can find the prince within us." She wants the song to inspire Asians and People of Color who might be struggling with their identity to look within to see the complex and beautiful rainbow they truly are. Thank you so much for joining us Kyoko. It was a joy to have you on the podcast and to hear how you use Bruce Lee’s philosophy in your daily life. Congratulations on releasing your song and thank you for sharing your gifts with the world.